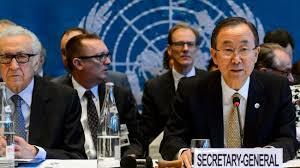 For Ban Ki-moon, the meeting is the only opportunity for a solution to the Syrian conflict. Syrian foreign minister slams Gulf States: "Someone in this room has blood on his hands." The Syrian National Council president wants Assad off his "throne". Russia emphasises Iran's crucial role in reconciliation. 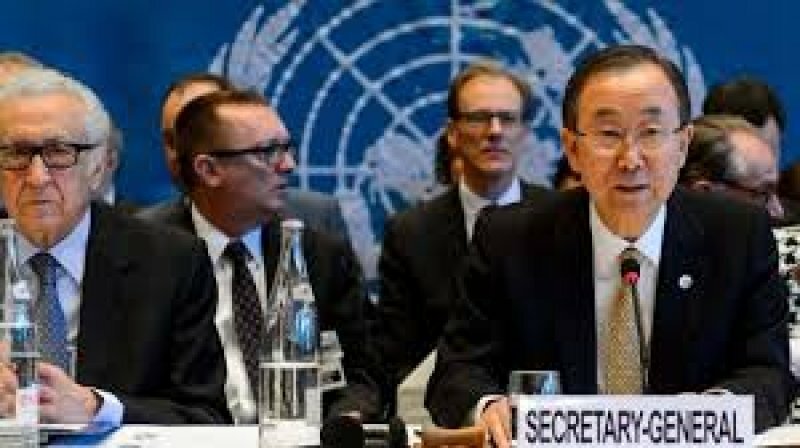 Montreux (AsiaNews) - In his speech opening the peace conference on Syria in Montreux (Switzerland), UN Secretary General Ban Ki-moon called, among other things, for an end to the violence, the establishment of humanitarian corridors and the creation of a transitional government to include all Syrians. For the first time since the conflict broke out, members of the regime and the opposition sat at the same table. In his address, Ban called on all the parties, especially the regime and the opposition, to put aside their differences and work together. "You have an enormous opportunity and responsibility to render historic service to the Syrian people," he said, and "seek a political solution to the death, destruction and displacement that is the dire reality of life in Syria today." Some 40 countries are represented at the meeting, including the representatives of the main sponsors of the conference - Russian Foreign Minister Sergey Lavrov and US Secretary of State John Kerry - as well as Syrian Foreign Minister Walid Muallem, and Syrian National Council Secretary Ahmed Jarba, the political arm of the Free Syrian Army. Russian Foreign Minister Lavrov was the first to speak. He called on "external players" to encourage Syrians to reach an agreement and not meddle with negotiations. Lavrov focused on Iran, which has been excluded from the conference, noting that the Islamic Republic will have to be involved in joint efforts to realise the principles contained in Geneva communiqué. For him, Syria's "transformation is going to be effective if it is purely political, without the use of force". US Secretary of State John Kerry began by launching an attack against the regime of Bashar al-Assad. Syria's "revolution did not begin as an armed resistance," he said. It "started peacefully. It was started by schoolboys in Daraa [. . .] armed only with graffiti cans, citizens who were peacefully and legitimately calling for change. And they were met almost immediately with violence." For the top US diplomat, the countries involved in the Conference must be "determined as ever to implement the Geneva communique;" however, this "means that Bashar Assad will not be part of that transition government" because "One man, and those who have supported him, can no longer hold an entire nation and a region hostage". Speaking about Islamic terrorists, Kerry said that they "worsen the suffering of the Syrian people", an issue that will be addressed in the coming days. A key moment in the conference came when Syria's foreign minister and the president of the Syrian National Council sparred verbally. Muallem openly blamed Gulf States, which are represented at the conference. Many of them are believed to be the main financial backers of the armed opposition. "Some in this room do not want to understand," Muallem pointed out, that "the countries that border with Syria, are not for peace in Syria, but for terrorism." For the Syrian diplomat, several countries present at the Conference "have blood on his hands." "In recent years," he explained, "we have seen terrorists come to Syria from 83 nations. Nobody said anything or tried to change the situation, continuing to speak of the noble Syrian revolution. We ask these people to go away and leave Syria." Muallem cited several violent incidents involving Islamic extremists, including the attack on the Christians of Maaloula and the kidnapping of Christian bishops and nuns. Assad's representative spoke for 27 minutes, far more than the seven minutes given to each participant, and was called to order twice by Ban Ki-moon, who still let the diplomat conclude his address. In his address, SNC President Ahmed Jarba laid out his version of the Syrian Revolution, which began peacefully but turned to bloodshed when the regime's military began cracking down. Until now, the NSC secretary had refused to participate in meetings with members of the regime. This time, "We came to Geneva," he said," "to represent those peaceful demonstrations. We reject the accusations. The NSC represents the Syrian people. Our aim is to bring down Assad". For Jarba, "Syrians are all victims of one man ['s efforts] just to remain on his throne, but there are no more thrones in the world." Turning to Ban Ki-Moon, the Syrian opposition delegate said that the NSC would be a party to the upcoming negotiations. After Muallem and Jarba, delegates for the other UN Security Council members - China, Britain and France - as well as representatives of the Arab League and the Organisation of the Islamic Conference addressed the conference. This Friday, negotiations between Syrian delegations will begin in Geneva, moderated by the UN and Arab League special envoy to Syria Lakhdar Brahimi.